Go to sleep…go to sleep…go to sleep. It was 9:40 PM on Monday, September 26th. I’d be driving away in four hours, and no matter how hard I urged my racing mind to rest, it refused to yield. Flowers…puppies…kittens…clouds…did I pack my sunscreen? Yes, the inside mesh pocket, next to the lens cleaner. I need to remember to take my meds. Like a thunderclap, the sound of my phone’s digital alarm startled me from my torpor. I snatched my phone from my nightstand, frantically silencing it to avoid stirring Beth. I was up and dressed in five minutes. I wandered through the house to collect the things I’d needed but couldn’t pack ahead of time. 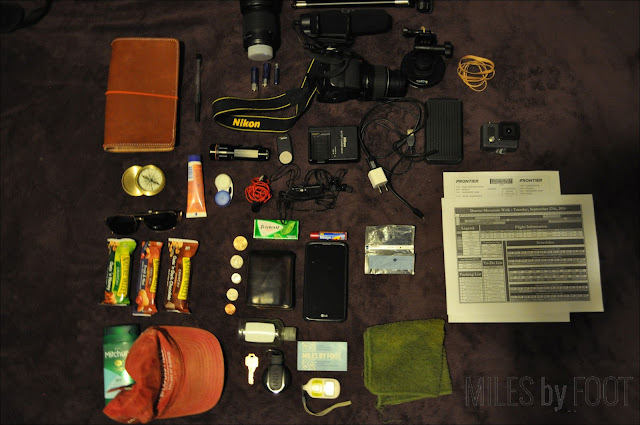 Keys, contact case, a bottle of water. The lights were still on throughout the house from my preparations the night before. It hadn’t felt like I’d slept at all, that I’d just been suspended from the world for a couple hours, and everything was just like it was when I left it. I stirred Beth, gave her a goodbye kiss, then made for the exit, turning off the house’s lights and closing the locked door behind me. The world outside was quiet and dark, shut off from the din and glow of the house. It was cool and clear out, and there wasn’t any moon to spoil the black. Its final sliver wouldn’t rise for hours. With my nine-months-pregnant camera bag across my shoulder, I made for the car, the first steps of many. 1:39, right on time. I expected it to take about two hours and fifteen minutes to get from my door to the airport. Google told me two and ten, but I knew better; with all the changes regarding the bridges, I planned a bit of extra time. 4:00 was my target time. In the silence of the night, the engine woke from its slumber, and we were off. Aux cable in, playlist on, trip commenced! Onto the rarely empty Hurstbourne Road, hang a left onto I-64 West, then towards the first city of the three I’d see in eight hours. As I came into Spaghetti Junction, the endearment Louisvillians use to refer to the massive jumble of interstate ramps east of downtown Louisville, the roads were aglow with construction lamps and flashing hazard lights. Concrete layers and earthmovers tossed dust and grit into the still morning air, shrouding the highway beneath a misty white haze. I slowed down, making sure I didn’t miss the navigable road I’d need to take to dodge as much of the progress as I could. Until last year, Louisville had three main bridges that crossed the Ohio River into Indiana: the Sherman Minton Bridge carries I-64 across the river at the city’s western edge, the Clark Memorial Bridge (or “Second Street Bridge,” as most Louisvillians call it,) which goes right through the heart of downtown Louisville, and the Kennedy Bridge, completed shortly after the eponymous president’s untimely death. The Sherman Minton Bridge was closed for five months several years ago after critical structural damage was found during a routine inspection, limiting the intensive intercity and interstate traffic to two bridges. The Kennedy, built about the same time as the Sherman Minton, was, in my personal, editorial, and uninformed opinion, likely also found to have compromised structural elements, but the four-lane Second Street Bridge would not be nearly enough to carry the entire load of traffic from one side of the river to the other for that period of time. Louisville would have come to a complete standstill, so I believe the city took a calculated risk. Either way, with this regulatory impetus, Louisville, Indiana, and the federal government finally came together to push through the Ohio River Bridges Project, a long-sought proposal to add and/or rebuild bridges across the Ohio. The new Abraham Lincoln Bridge was finished last year to take the northbound traffic from I-65 across the river, and the Kennedy is being totally rebuilt to carry only southbound traffic, effectively doubling the lanes in each direction. All that added up to a mess at 2:00 AM when I got there. The on-ramp to cross the river via the Abraham Lincoln bridge was closed from my vantage, forcing me to either double back through downtown to get onto the hopefully-open I-65 North, a potentially wasteful gamble, go all the way to the Sherman Minton and cut back across Indiana’s I-265 east, a costly time guzzler, or to take the smaller, likely crowded Second Street Bridge into Jeffersonville, Indiana hopping back onto I-65 when I got across. I opted for the last option. I swooped through the underpass beneath the idle I-65 connector, dipping down at River Road to cross over to the 2nd Street Bridge. The city was still, the lights changing for no car in particular as they went about their patterns. A few turns and I was on U.S. 31, soaring across the inky waters of the river, unencumbered by traffic or construction. Until the derelict Big Four railroad bridge was restored and repurposed to carry pedestrians, the Second Street Bridge was the only way for nonmotorized traffic to directly cross the river in Louisville. It’s still the westernmost bridge on the entire Ohio River with an actual sidewalk. If you want to cross on foot downstream of here, you better look, and move, like a car. This was the quietest I had seen this bridge, and I was grateful for an uneventful crossing. Construction still made things difficult when I got to Indiana, as the I-65 ramp I anticipated using was blocked off. Jeffersonville was deserted at that time of night, so I wiggled through the side streets I’d discovered on my Falls of the Ohio walk two years ago to get back on the interstate. It was 2:10. Now, friends, we wait. The drive from Louisville to Indianapolis is an unenviable one, even under perfect conditions. Beautiful spring day when all the trees, bushes, and flowers are green and in bloom? Still so-so. Doing it in the middle of the night in fall? Pass. Indiana is, in my opinion, a rather uninteresting state as a whole, at least to traverse. North of Indianapolis, it gets pancake-flat in the stretch between Lafayette and Chicago. Even as you near the state’s capitol, you can feel the undulation of the hills normalize towards an undictated median. 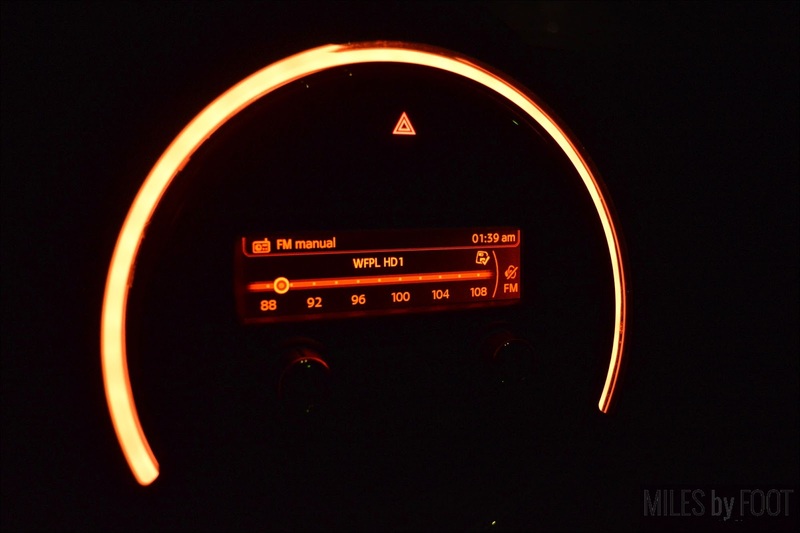 My playlist blares my carefully selected queue of driving music, a blend of evocative, lyricless electronic music. Despite the lack of sleep and, oh, the meds I didn’t remember to take, I have good energy. I pull out a peanut bar, my bottle of water, and one of my apples, aware that I’m going to need the fuel today. I knew where I’d be getting my next hot meal, though, and I couldn’t wait. Seymour, Indiana is a gracious halfway marker, providing a virtual middle point between the Ohio River and Indianapolis. Once we’ve passed that point, it’s all downhill. Well, neutral-hill. There’s a lot of trucks out, but I figured, honestly, that this would be the quietest you could find the Interstate. It’s a Tuesday morning, the lowest day for most every business including travel, and it’s not a busy time of year. Still, at 3:00 AM, there’s enough cars out here to keep you awake. Over the last few years, I’ve driven up to Indianapolis several times for one reason or another; business school, gaming tournament, concert, and, now, early morning flight. I’d done it enough to recognize the buildings and the terrain when we’re getting close to the city, and those telltale signs arose on the landscape before I knew it. It arose so fast, in fact, that I missed the ideal turnoff point for the airport at Exit 106 to get on I-465 West. Admittedly, this is the faster way, but it was a way I didn’t know. I-70 was in my head and, arguably, easier to follow at night. My phone’s GPS chirped as it recalculated, and I pressed on to the next available turn. At 3:40, I saw the twin spires of the Chase Tower. When I was younger, I loved long road trips, and my favorite part was coming upon a new city. Seeing a new skyline was my favorite part of a trip; even if it wasn’t our destination, it was exciting to see another big spot on the map after seeing endless miles of that pesky, formless “nature.” From a young age, urban adventure was always on my mind. Traveling as a kid from Louisville meant that Indianapolis was both a common destination and a frequent waypoint, so the twin antennae atop the Chase Tower were always a lighthouse, a silent, visual announcement of the trip’s progress. No building in Louisville looked quite like it, either, so it helped me feel like I was in a new, unfamiliar place, even after only a short drive. It didn’t help that Nashville’s AT&T Building’s pinnacle has a similar, two-pronged shape, and even the Willis Tower’s twin transmitters mirror this silhouette. Any such building made me feel that emotional surge of discovery. When I saw the towers this time, though, they did actually herald an adventure. The westbound ramp carried me to I-70, the final road to my destination. I turned my phone’s GPS off; my next turn should be clearly marked. Just fifteen more minutes, then the walk can truly begin. I love getting near airports when that’s where you’re already heading. Chances are, there’ll be a plane flying overhead to get you pumped up for whatever trip you’re starting. Even at a pinch before 4:00, huge cargo freighters soared overhead, both inbound and outbound. IND houses one of the largest cargo hubs in North America for FedEx Express, much like SDF in Louisville houses UPS’s main cargo facility. Both airports are still crammed full in the early morning as monstrous vessels move through the airspace. The wide lanes, meant to accommodate heavy traffic flow, are nearly empty at this time of the morning. Still, I can’t be the only person getting on that flight. IND has a parking garage for the fancies, but they’ve also got economy parking for the rest of us plebs. Ironically, because the garage is hourly with a daily maximum, it almost might have been cheaper for the roughly 24 hours I’ll be gone to park in the garage. But, in case I did my math wrong, I’ll just stick to the vast expanse of single-story parking spaces. Wow, right on the nose! I’ll tell you what, buddy; planning in extra time for the unavoidable delays and personal screw-ups possible in travel really pays off. Locking away my house keys and keychain in the glove box, I took just my car key, stowed it in my too-small-to-fit-anything-else pocket on my camera bag, and got out of the car. To my right, a roaring jet took off to the south. At 4:00 AM, FedEx was still going at full strength. I’m sure, as is the case with Louisville, that there are cargo flights throughout the day, but they really pick up at night, when passenger flights have all but ceased. IND has two major runways that run parallel to the terminal and the parking area, plus a smaller, perpendicular one on the north side of the airfield. The big guys use the long ones, though, so you’ll always have a good show when they take off or land. As if Indiana knew I was talking smack about it, the temperature had grown colder since I left. While the temperature hovered in the upper 50s while I was in Kentucky, a full ten degrees had fallen off since I crossed the river, and it never went back up. My shorts offered little protection from even a slight breeze, and I was struggling to keep my warmth in the long walk from my parking spot to the terminal. The parking garage was a welcome respite from the slight, but frigid breeze. Even at 4:00, though, the garage was rumbling with cars and abuzz with both excited families traveling somewhere fun and sober businessmen marching off to an early flight. On the other side of the cacophonous garage, the world was eerily still in the early morning darkness. 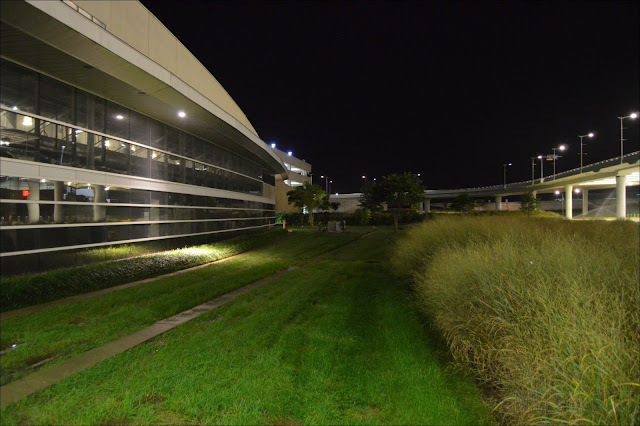 The wash of artificial light gave the buildings an oddly colorful glow, the green of the manicured grass clashing with the glass, plaster, and steel of the modern infrastructural installment. Behind me, eager travelers passed behind me, but looking out over the decorative lawn, I felt quite lonely. 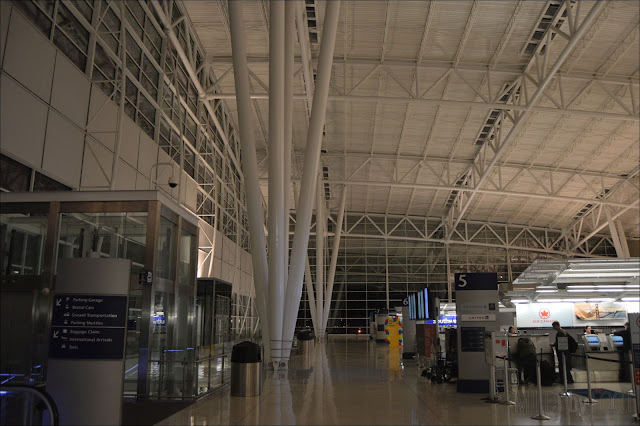 IND has the feel of a huge airport, much like one you’d find in LA, San Fransisco, or, honestly, Denver, but it seems too big for its britches, camped out here on the edge of the Midwest. 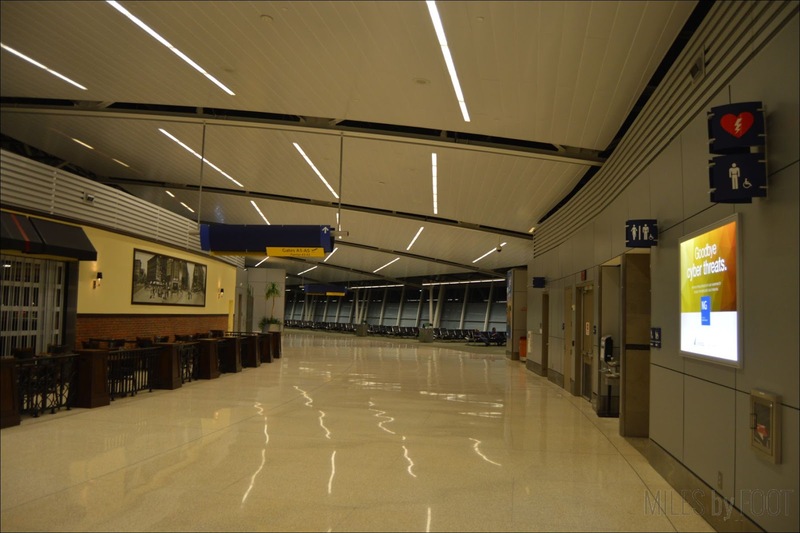 This modern a facility is rare in our neck of the woods, and whether that’s the reason IND is such a successful airport or its earlier success allowed the construction of the new terminal was still a mystery. The pick-up zone felt cavernous. Long have I sat at SDF’s waiting area as my mom flew back from some large Midwestern city after a speaking engagement. The portico gave a constant sense of comfort, no matter the weather or time of day; soon, someone you’d love would come through those automatic sliding doors. In the chill of the night, though, the four-lane road was empty, uncomfortably large, almost wasteful. Soon, I’m sure, each lane would be filled with minivans, taxis, and family and friends waiting for their loved one to come back home. I entered at the lower level, home to the baggage claim. The large claims were silent, and all but one had blank announcement boards. The one that was lit up had “Frontier” on it. The return flight from Denver that would be providing the plane we’d use for our excursion was bringing a load of people to Indy, and in about 24 hours, I’d be right back here. A tall escalator led me up to the second floor. Ahead was the Civic Center area, the rotunda from which you could choose your appropriate terminal for security. Until then, though, I would check the departures area for the completionist in me. Again, the Indy airport feels overly large, but I’m not complaining. I love the feeling of openness. The taller the ceilings, the closer you feel to the sky. 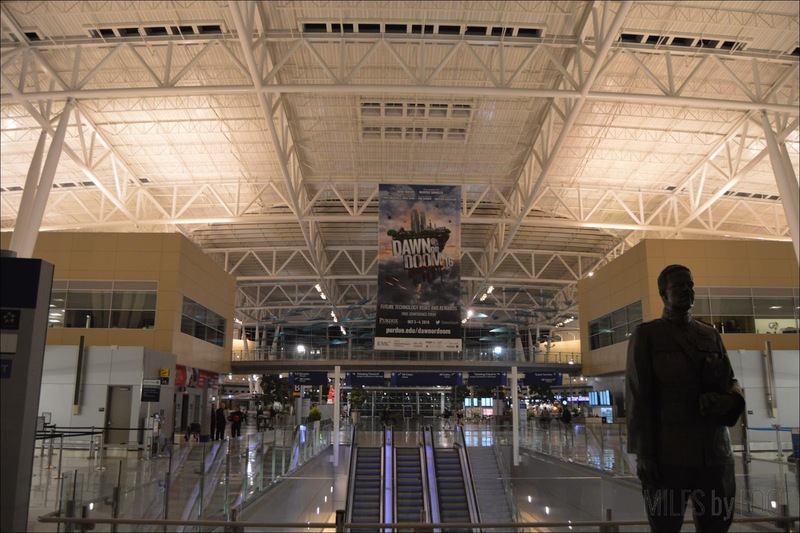 Most of the usual suspects were represented: Delta, Southwest, American Airlines, and United were all here, with a slightly broader selection of destinations than Louisville. There was also Air Canada, as Indianapolis supports a couple regional flights a day to Toronto. Enough to validate the “International” moniker that’s become so popular among airports these days. That being said, a couple seasonal flights fly south of the U.S., too, mostly to vacation spots in the Gulf. No need to go to the Frontier desk. I had that pass printed off already, and I’d use the app for the rebound flight in 22 hours. It was twenty after four. I planned to go through security in about fifteen minutes, so I figured I’d just sit a spell and listen to the world wake up. I took the time to more tightly repack my hastily assembled camera case, knowing full well I might have to take it apart again going through security. I felt surprisingly awake. I hadn’t had any caffeine, basically ninety minutes of sleep, and I’d just driven two and a half hours through some dull, dark scenery. Still good to go. Indianapolis’s airport is very straightforward, and its U-shaped terminal building is easy to navigate. 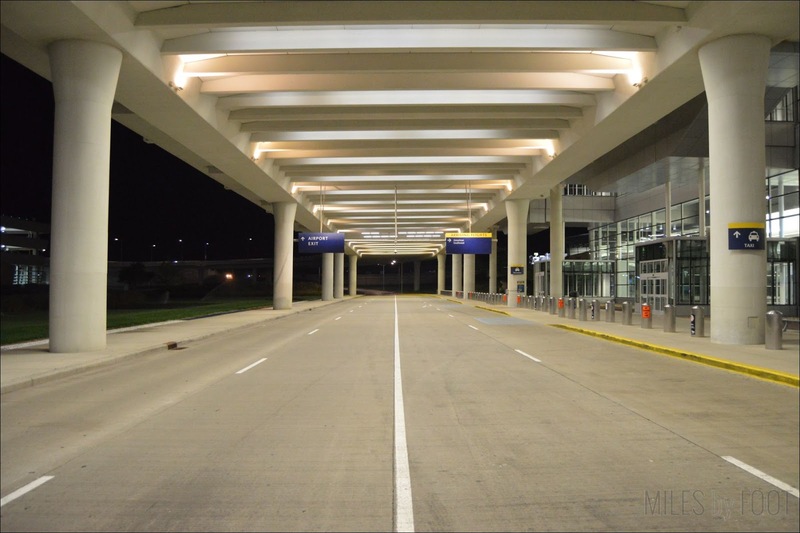 There are two concourses, one to the left, Concourse B, and one to the right, Concourse A. This seems backwards to me, as I would expect a west-to-east or north-to-south naming convention, but hey, I didn’t make it. 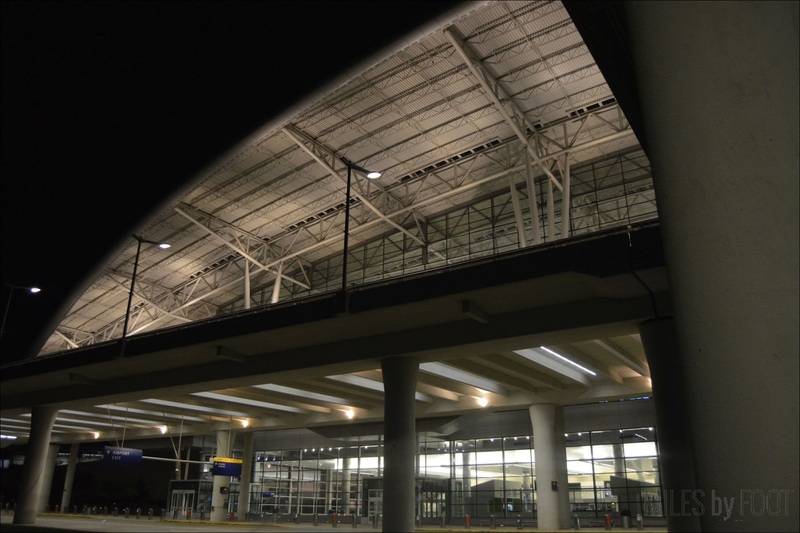 These concourses, like those at SDF, are mirrored versions of each other, built at the same time with the same design elements. 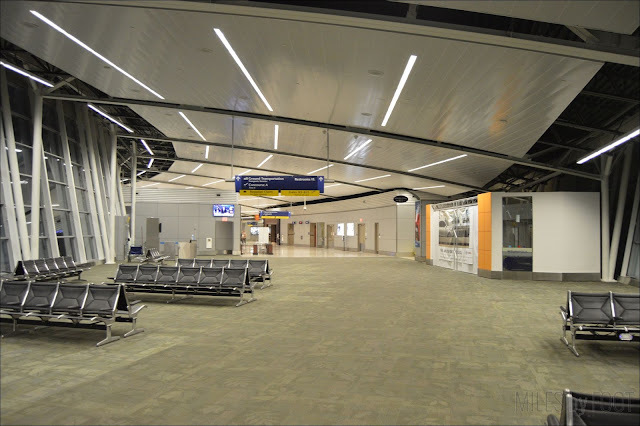 Like at SDF as well, there is a communal transfer hall past security, allowing passengers to easily transfer between terminals without having to leave the sterile part of the airport, allowing easy cross-carrier transits. Frontier uses Concourse B, the northern terminal, so that’s where I’d clear security. Bag on shoulder, camera stowed, and through security I go! Getting there at the beginning of these TSA agents’ shifts has some upside. I’ve never had much problem with TSA in general, but these agents were particularly chipper, and it made the very short line through security even shorter. A thorough screening, and ten minutes later, I was ready to start my walk slightly ahead of schedule. I wanted to walk Concourse A first, then walk Concourse B to my gate, exploring as time allowed. As I crossed through the walkway, I could see the airfield to my left and the rotunda to my right. I’m sure it’s quite a site at sunrise or sunset, seeing the planes silhouetted against the morphing sky. In the dark of pre-dawn, though, it was easy to pass right through to the first concourse. 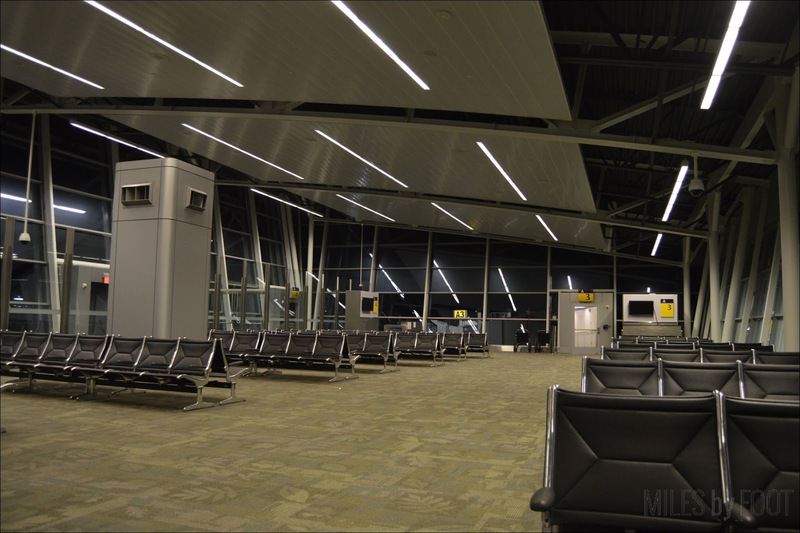 Each concourse connects to the main terminal, with a small spur to one side and the length of the concourse on the other. As I arrived at Concourse A, the spur took me to the right. This really did look like quite the modern airport. You could put this waiting area in the biggest airports in Europe, Asia, or South America and it wouldn’t be out of place. At this hour, very few gates were being utilized, so the entire spur was vacant. Back the way I came and on down the hall of Concourse A. 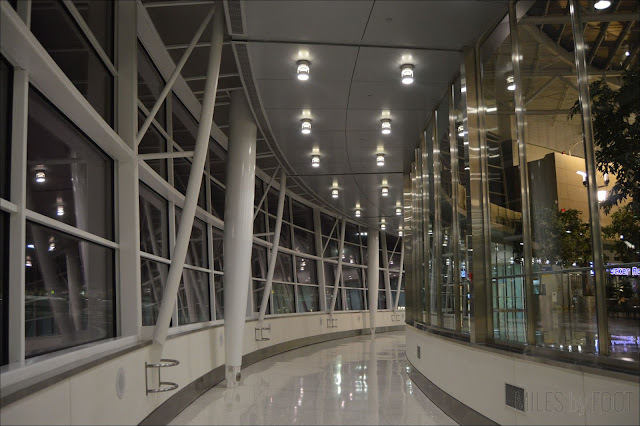 The concourse was spacious; the curved ceiling, sporadic moving walkways, and clean appearance reminded me a lot of Hong Kong’s airport, both modern and functional without much frill or personality. But that’s OK. Some of the food places were just starting to open to serve their first customers, but many of the souvenir shops and newsstands were still closed. Admittedly, I don’t think I’d be buying a Colts hat at 4:30 in the morning. I used the moving walkways to maximize my time. At our own airport, local speaker and personality Jack Fox had recorded the friendly reminder that the moving walkway was ending. Here, it sounded like a Pacer, with the deep, Midwest voice of a tall basketball player. You know, I just now got the idea behind the Indiana Pacers’ name. Like a pace car for the Indy 500! Man, that’s clever for them, and embarrassing for me. The concourse was deceptively long; a quarter mile from end to end, and even with the walkways, it took a bit to get to traverse the whole thing. It’s hard to imagine with so many empty seats that they’d ever be filled, but Indianapolis handles three times as many passengers as Louisville does, so I don’t doubt that, during a heavy travelling season, there’s kids, businesspeople, tourists, and teenagers all jostling for outlets and seats. Not now, though. It’s strangely relaxing. It was a hair after 5:00 AM. Our flight leaves just after six, so I have about a half hour to get over to the gate. Things were starting to pick up a little. Airports get started early; there’s a lot of people that want to get somewhere. 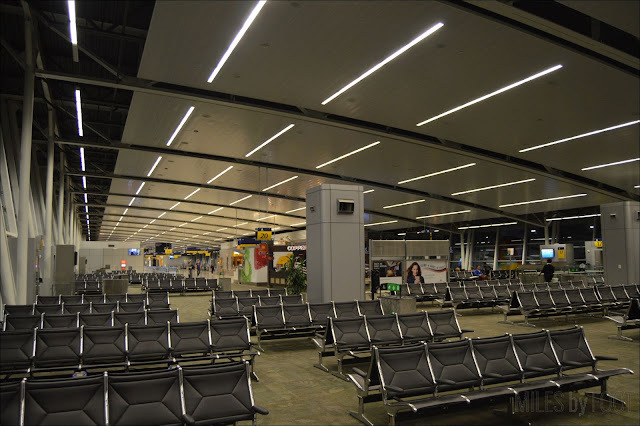 More planes had started heading out to their stands, so the return through the transfer hall was aglow with the blinks of landing lights and the lights from each concourse splashing out onto the tarmac. Although the glare was too bad from the internal lights to get much of a picture or a video, it was fun to watch them silently glide. Concourse A had been fairly quiet, with maybe one or two flights leaving that early in the morning. Concourse A is used by Delta and United, and at least in Louisville, nothing flies out that early. Concourse B features low-cost-carriers Allegiant Airlines and Frontier Airlines, of course, as well as American Airlines and Southwest. These are probably the less expensive slots, so I imagine it'll be a bit busier. Oh. Well, maybe in a minute. As I expected, Concourse B mirrored Concourse A. The only companion I had in B's spur was an older man, quietly petting his service dog. As I zipped through and took pictures, neither he nor the dog seemed to notice me at all. I was nervous to take their picture, either directly or surreptitiously. They didn't need that. As I moseyed down the concourse, the sounds of life stirring echoed down the polished floors. Gates were piling up with groggy passengers, each clutching their family, their coffee, or both. I liked the peace and quiet of Concourse A, but Concourse B had plenty of people-watching to offer. My flight was leaving out of B15, near the terminal's northern cluster of gates. The widely spaced gates made the distance considerable, but soon I arrived to find my gate the busiest of all. Next week, we'll take our first trip on an ultra-low-cost-carrier and share the experience. Then, it's off to Denver's expansive airport and the city that lies beyond! Until then, keep going! For hundreds of years, Colorado has been the edge of the frontier. With endless plains on its eastern edge to jagged mountains in the west, Colorado is one of the most geographically and culturally dynamic states in the U.S., and as such, it offers an enormous variety of experiences for locals and travelers alike. It’s always been one of my favorite states in the Union, and I’ve been there several times in my life both for business and pleasure. It’s hard to see it all, even in a lifetime, but what could I see in a day? When you see photos like this one, it’s hard to not like Denver, Colorado’s largest city. Denver has a storied history being the base of frontiersman, prospectors, farmers, ranchers, businessmen, and explorers. Denver was a city built on the hopes of the future, with the promise of gold, land, and independence. It’s a centralized city designed to give people the footing they need to explore. But don’t you worry; Denver itself has plenty to see. When I started Miles by Foot in 2014, I made an initial list of all the cities I’d like to walk in the United States. Denver was the third city on that list, but it took me a while to get there on a walk. Between school, life, work, family, and other, more demanding hobbies, I had trouble making time for walks like I used to, but the burning urge to explore was still smoldering. I knew Beth would love Colorado, so she and I went there in October 2015 for an anniversary getaway and we had a great time, staying in a little apartment in Capitol Hill and exploring the city and its environs, including Colorado Springs and Boulder. When we flew back to Kentucky, I knew I needed to strike Denver off my list and do the solo walk I’d always wanted to. The last full-distance walk I’d done, at least officially, was Chicago, in March 2015, nearly two years ago. Chicago is an easy target for us here in Louisville; it’s the cheapest destination by air, it’s close, and it has multiple airports, so every major airline offers a route to the Windy City, so trips there are pliable. Using my trip to Chicago as a template, I would try to walk the city of Denver in one day, flying out in the morning and flying back that same night. There is a short list of realistic one-day destinations from Louisville by air, and Denver isn’t one of them. Denver is four times as far away as Chicago, meaning that nonstop flights, while they do exist, are far less common and more inconveniently timed, which can cut deeply into the time I have to walk the city. Only two carriers fly to DEN nonstop from SDF: Southwest and United. Even with as open-ended a window as possible combining both carriers, you’re only looking at about seven hours from the time the outbound lands in Denver until the return flight to Kentucky takes off. That’s not including transit through the airport and to Denver itself, airport security, and other biological and travel machinations that you must factor into an accurate timeline. Taking this into account, you’re looking at four hours or so “on the ground,” which is far too little time for hassle and the cost, which easily broke $350.00. Staying overnight confounds the purpose and novelty of a one-day trip while considerably increasing the cost. Still, Denver has enough to offer for me to consider creative alternatives. Denver is on the edge of the frontier, so maybe their aptly-named hometown airline could provide the connection I needed. Although Frontier doesn’t fly out of Louisville, they do fly out from most of our nearest urban neighbors, including Cincinnati and Nashville. The most attractive option, however, flies out of Indianapolis. 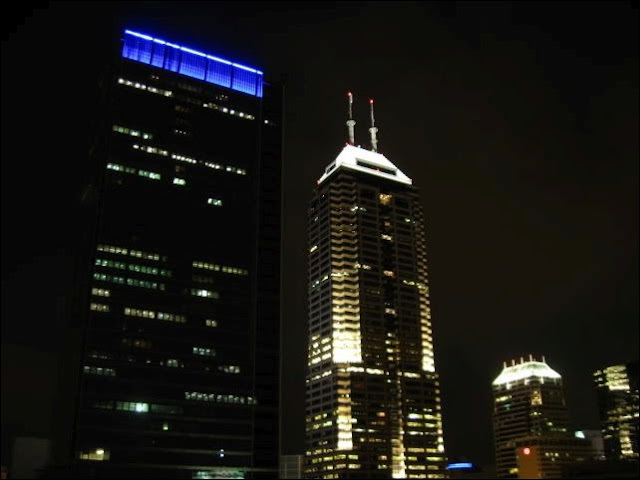 Indianapolis is about a two-hour drive up the road from Louisville, a little less than halfway to Chicago, and the drive is as simple and straightforward as it gets: hop on I-65 North and keep driving until you see the Chase Tower’s distinctive two-pronged profile against the sky. Hang a left to get to the airport on I-70 West, and voila! Besides being a close alternative, Indianapolis has a world-class airport that I’ve never flown through, providing additional incentives to cross into the Hoosier State. As opposed to a mid-morning outbound flight and an early evening return offered by flying out of Louisville, Frontier’s flight out of Indianapolis is exceptionally early in the morning, and its return is very late the following evening, giving an enormous gap of time to see and experience both airports and Denver at a leisurely pace. This would require an even earlier start, as I’d have to drive from Louisville to their airport, IND. Still, this is how I like to do things; besides, for busy people who still love to travel, this is often the only way you can make these kinds of things happen at all. 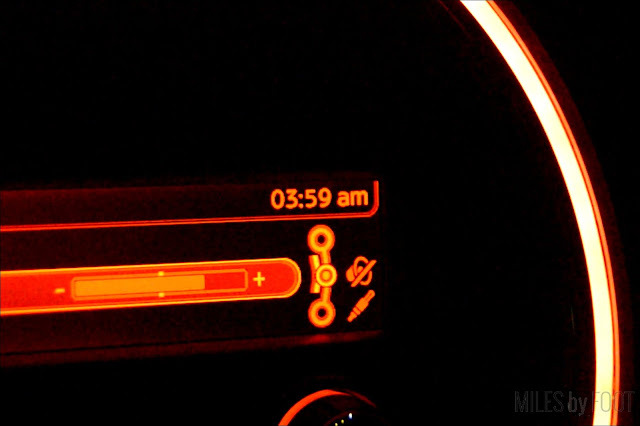 From the time I got in my car the morning of my Chicago walk to the time I trudged back in was about seventeen hours. This would push that number to about twenty-nine­ active hours, all without much sleep except for the minute amounts I could grab in transit. This would, like Chicago, require careful, close-knit planning to fully realize such an intense, circuitous route through Denver to catch all the sights that make it such a great city to visit. Frontier Airlines is an ultra-low-cost-carrier, or ULCC, a relatively new designation to the commercial airline industry, especially in the U.S.; Europe and Asia have been featured ULCCs for years, but we’re just catching up over here. Since 9/11, every airline around the world has changed the way they structure their services, developing increasingly segmented offerings from full-service to bare bones. Many consumers see this striation as a way to nickel and dime them, charging them for every little thing they expect to be included in their ticket price. That’s less the case now, and from an industry perspective, this makes sense. Charging consumers for specific services they use is, well, how a service business works, and letting people elect those parts of the ticket they want tells the industry, using the dollars-and-cents vernacular in which they have become fluent, what actually matters to their customers. It also allows people who wouldn’t have needed all the “extras” offered in a standard ticket a chance to get on a plane at what could be seen as a discount, which brings new business to the industry. Some complain about airlines like Frontier and their ilk, but as long as you know what you’re getting into, you only have yourself to blame in the majority of instances. Frontier would be my first experience on a ULCC, and as weird as it is to admit, I was looking forward to it. I’d heard horror stories about missed connections, delays, and poor service, but I had faith. Denver’s a great city; hopefully, their airline would deliver me there in a safe, timely, and novel manner. When it came to pulling the trigger and booking the flight, I found a narrow window in September where the price was low, the one-day return was possible, and the weather would still likely be good. Booking mid-week helped tremendously, so I planned for Tuesday, September 27th, 2016, slightly less than a year after Beth and I went. I booked less than a month out, on Labor Day, but even as close as it was, the base ticket price was hilariously inexpensive: $43.10 each way. That’s $86.20 for a round-trip flight covering 2,000 miles in a combined five hours. Driving 2,000 miles in an efficient car would still put you at around $125.00 just for gas, not to mention the thirty hours of time spent driving, the exhaustion that comes with that, and the cost of parking your car in a major city. This was the way to go. That price was amazing, but after buying the base ticket, everything else cost money. Want to check a bag? Costs some money. Want to print off your ticket at our kiosk? Five dollars. Oh, hey, are you bringing a backpack and a camera bag? More expensive than that checked bag. That’s right; you only get one item for free, and it’s a small, personal item at that. On most “full-service” airlines these days, you’ll get both a sizable carry-on bag and a personal item for free. Not here, though. To add to the challenge, I’d have to carry my camera bag alone. My small, trusty backpack was too big to fit their restrictive size parameters for a personal item: 8” x 8” x 14”. As is, my camera bag would barely fit. Time to bust out the cargo shorts to carry everything else. The only upgrade I chose was selecting my seat, and it wasn’t even for a higher-quality seat or more legroom. I always like a window seat, so I paid $19 on my outbound for the farthest forward window seat I could get. My return window seat was much cheaper at only $8. Still, this put my entire flight cost, taxes and all, at a paltry $113.20. I’d print off my boarding passes before I’d go, or I could bring it up on my phone, so this was still an exceptional deal, perfect for a trip like this. I could drive to Indianapolis, but once I land in Denver, I’d have to get from the airport all the way downtown, which is no short distance. Thankfully, Denver just opened a direct rail link from the airport to their central business district within the last few months. Beth and I had seen the signs of the last steps of construction of the rail line when we were there in October. Good timing! This would also give me an anchoring starting and ending point for my walk: Denver’s Union Station in Lower Downtown (LoDo). So where do I walk in Denver? Chicago is full of recognizable landmarks, like the Willis Tower, Wrigley Field, and Michigan Avenue, all places I passed on my walk in March 2015. Denver doesn’t have the landmark recognition level of Chicago and, to be fair, few cities do. Instead, I recalled the details of the trip Beth and I took to plot out those places I thought would be worth experiencing on foot. When we were there together, we had a car, but I had a feeling Denver would feel much different on foot. I did some research on the city and its landmarks, nailed down a solid circuit, and surveyed its distance, coming up with around fifteen miles of walking in Denver proper, this time with a planned stop for lunch. This trip already involved a frighteningly early start, a moonlit drive, a tiny luggage allowance, a lengthy, uncomfortable flight on a budget carrier, a train ride, a formidable walk in the Mile-High City, a train ride back to the airport, and an overnight flight back to Indiana, where I’d then have to drive two more hours after walking a marathon. Yep, that sounds about right! Pretty good use of a Tuesday if you ask me. Next week, we’ll start the trip. Make sure to swing by, and remember, keep going!